Check out these benefits to installing a patio. It is beginning to get hot outside, so you know what that means: outdoor entertainment and parties! There is no better space to hang out outdoors on your property with friends and family than on a patio. A patio in your backyard is the perfect way to transition your indoor space to your outdoor living space seamlessly. Showcase your style while injecting versatility and character into your backyard. Whether you want to start from scratch or feature a part of your yard that is already there, Edward’s Lawn is here to help you from day one on the job. Here are a few reasons why you should consider adding a patio to your beautiful home. No backyards are the same, so patio installation tends to differ from project to project. You can choose how big or small you want your new outdoor space to be depending on your wants, needs, and specifications. If you have difficult outdoor areas, like curves, bumps, or stumps, you can even incorporate these to create a space that is truly unique and reflects you. Turn your outdoor living space into the perfect entertainment area so you can party all summer long. 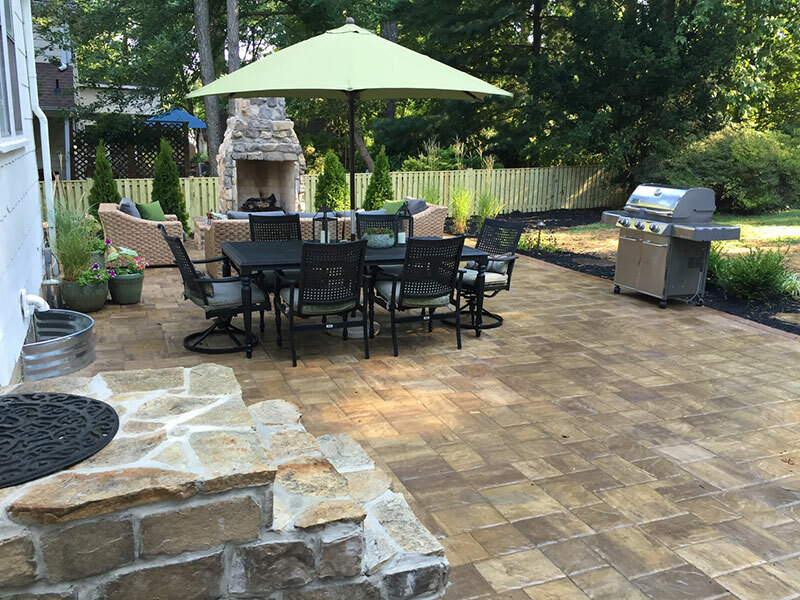 Once your new patio is installed, the fun is not yet over- it’s time to fill the space with elements that you pick and choose. Depending on what you use the space for the most, consider adding grills, furniture, bars, and fire pits to your space. You can even incorporate some of these features into the construction of the patio itself. Whether you choose stone, concrete, pavers, or bricks, your new patio will be super easy to maintain. At the very least, pavers and bricks will need sanding in the joints between adjacent pieces to avoid weed growth, but then all you have to do it the occasional sweeping. Owning A Patio Is A Breeze! Your new patio can be constructed with materials to withstand the test of time and the forces of Mother Nature. Concrete, pavers, bricks, or natural stone will be sturdy and functional for years and years to come. There are even options to add sealers to your finished patio to make them even shinier and sturdier than before. There is also the additional benefit of protection from harmful UV rays. For almost ten years, Edwards Lawn and Home in Linthicum Heights, Maryland has been a trailblazer in the area for offering premier residential services to improve your property in any season. As the winners of the Angie’s List Super Service Award, we are ready to start your patio install whenever you are. If you have questions or are ready to get started visit us online or give us a call at 443-341-6539. For even more information and to see some recent projects we have been working on, follow us on Facebook, Twitter, Google+, LinkedIn, YouTube, and Houzz. This entry was posted on Friday, June 1st, 2018 at 2:02 pm. Both comments and pings are currently closed.